This fly has its origins in fly fishing competitions. It is neither a nymph nor a lure but can be fished as either. Primarily a still water fly it can also be used on rivers and tied with a silver or holographic body. It bears more than a passing resemblance to a butcher , only with more mobility. The early patterns were tied with a body of peacock herl with a wire rib. More recently you will see them tied with fine fritz or metallic bodies, usually silver. This is because of the fragility of peacock herl. A good fly to have in your box, particularly if you do boat fishing. Regards, Dave Cammiss and the Team. @ Paul Lewis – Hi Paul, when tying the Cats Whisker or other lures with long tails such as the Yellow Dancer you may find it more useful to use Marabou Bloods rather than Marabou ‘stalks’. some stockists in the UK will supply bloods tied together or they will supply ‘selected’ bloods. The problem with bloods is that in some cases when tying the fly, you may be compelled to tie on a longer tail to impart movement more movement within the fly and you will get more ‘tail nips’ from trout that actual ‘fish ons’. A way round this, is to use the technique that Dave has used in his Yellow Dancer video, and pinch the tail back once it is on the fly. In any case, I would suggest wetting your fingers and thinning out the marabou and tying it along the full length of the body to make a finer, more uniform body rather than having a taper at the rear or front of the fly depending on what fly is being tied. A point of note, for smaller flies, it is probably better to work with the marabou ‘stocks’ to minimise wastage of your bloods. As a beginner I have started tying the Cats Whisker, the video was realy great and easy to follow. My problem is finding Marabou feathers the same quality and length as the ones you use. Could you please advise where I can purchase good quality feathers. In the UK there are many books on where, how and when to fish but they would be of little use to you in India. I do not think you can imagine how we fly fish for trout in the UK. You would probably think we are crazy. Maggots do not feature in trout fishing here. Speaking from experience you do not want to start breeding maggots. It is a dirty, smelly and not very healthy job, maggots become flies and with flies come diseases. thanks for your comments. Any fly you tie is only limited by your imagination. Use the basics and embellish it in any way you like….there are no rules. There is a vid on the yellow dancer. scan thro the intermediate file it is lesson 6. It is a relatively easy tie. Good luck with it. Thanks for your comment,i still have few queries to ask. 1. do you have any book which tells about the basic angling things like hook size and line size, size of hook to be used for fishing big ones, how find spot where fishes will be there in a lake or river or any water body. how to attract the fishes in groups to bring them in angling spot. 2. I like to know about the maggot , how they use it for fishing, how to prepare maggot in home etc. Thanks for your e-mail all the way fro India. Most of the fly fishing done here in the UK is in still water reservoirs and lakes, mostly for trout. Fly fishing, which is the most sporting way of catching trout, is not the easiest method and does require special rods and lines. The one fish , the cat fish, is the only one I know about and that is not fished for with the fly here in the UK. Sorry that I cannot help you any further. 1. Is it possible to fishing using fly in still water. 2.Here the fish varieties are BRASS, SNAKE HEAD fish and CAT fish. Is this fishes can be catch using Fly fishing method. The above varieties not visible in still water. hey there dave quality vids man i lv the cormorant i use it a lot but i’m trying some variants at the moment im tying the cormorant with a flo green antron wool body and a silver tinsel rib ‘i’m shaping the body like a buzzer eg down past the bend of the hook and running some wire back up round the body to the head.i also love the yellow dancer well i got handed one …a home made one one day in the carpark of my local fishery and i bagged up in jig time and would love to be able to tie one i cant find a vid of you tying one ..would be great if you could help me and prob a thousand other fisher out there. can you ask the backroom boys if they can rename the lessons from 1,2 3 with the names of the fly in them? Have wanted to look back and have to google to save time going through them all. Thanks for your comments. There will be more vids on the way. We will be doing a DVD later in the year. I dont know which vice that Veniards put in their kit, but it should be adjustable for the tension on the chuck holding the hook. Do not put any more tension on the chuck than is necessary to hold the hook securely. Try to keep the point of the hook in the jaws to avoid catching your thread. Before tying the fly give the hook a little ‘ping’ it should give a clear ring. Hooks these days are generally of a reasonable standard and tend to bend rather than break. It may pay to pay more for hooks. I would recommend Kamasan but have been happy with Royd hooks . See useful sites list. Have found your videos interesting and restful to watch but stimulating so much so that I have started trying myself. Have you got any more planned? Glad to hear you are having success with the minkies. I rarely fish lures but my colleague just loves minkies, his other standbye is the woolloey bugger. When all else fail on goes the woolley bugger. Having been inspired…. 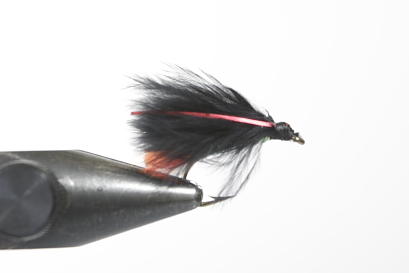 ( Thanks ) I have been tying a few variants with Mink strip and already geting great results. A brilliant material, all be it, rather expensive. I have managed to tempt fish to take, when they would normally not stir, so well worth the effort. Don’t know about your part of the world, but over Cheshire way, in the last few years we have noticed a decline in the great summer evening fish rises that used to prevail. As yet, no explanation has come to light. Thanks for your comments. We get a lot of fun doing them. My elder son Andy does the guitar backing. He will have a big smile when I show him your comment……..He is a drummer and does teach drumming. Jon does the photography and I have the easy bit tying the flies. I am really enjoying your site and it is extremely relaxing too. Great productions from you and the team and love the guitar music too. Best web site I have found in a long time.